I get it: sometimes (often, if we're truthful), women are not comfortable speaking up. The reasons are as varied as we are. We don't think we know enough on the topic. We don't want to appear pushy. We don't want to appear to be bragging. We haven't been invited into the conversation yet. The list goes on. I have news for you: we're not doing ourselves any favors by not speaking up, offering our opinions, or (god forbid) taking charge of the conversation. In this article, I will provide some tidbits that will help you get over your "what ifs" and speak up. Full disclosure: as I am writing this, I have to keep editing myself. My original sentence read "In this article, I hope to provide some tidbits that might help you get over your 'what ifs' and try to speak up." Notice the difference (hint: I've bolded the words that portrayed uncertainty and were wishy-washy). This uncertainty is part of the problem. We are so wired to be humble that we minimize ourselves without even knowing it, and we do it all the time! How do we knock it off? I have some ideas for you. Authenticity may seem counter-intuitive, but you have to practice being authentic. We are so used to hiding at least some of who we are that we need to be deliberate in bringing out our authentic selves. The best way to rewire our brains and change our behavior is to practice. Play out scenarios with trusted friends or family. Get comfortable with who you are, and let her shine! But be wary of getting stuck in your comfort zone. I worked with a woman who was a brilliant, smart lady. She was also super casual. She dressed down (which is fine if you're not hiding under your baggy clothes), kept her hair over her face, and kept her head down. One day, she was called upon to present to a group of company leaders, so she made some changes to her appearance. The changes were nothing drastic, and she was still authentically herself but more fitting to the occasion. Something else changed in her that day, though: she saw herself through new eyes. From that day forward, her demeanor changed. She was more confident, and soon after, opportunities came her way that would not have if she kept hiding. So, bring the best you that you have. Being authentic doesn't mean staying stagnant, though. Personal growth is something we should all invest in. Not for the job or for our partners but for ourselves. Sometimes, personal growth gets uncomfortable; do it anyway. The biggest growth is in the discomfort. Allow yourself to dig deep, and I promise you'll find diamonds. We are a tribe of apologizers—stop it! Apologizing dilutes what you're trying to portray and strips you of credibility. If you have something to apologize for (but likely, you don't), say "I apologize," or "forgive me," but please stop punctuating everything with "I'm sorry." "I'm sorry I'm late," "I'm sorry I didn't catch what you said." Instead of saying, "I'm sorry," say "Thank you." Instead of saying, "I'm sorry; I didn't hear you,"say, "Could you repeat what you said?" Then say, "Thank you." There's a great article on that here. Don't Wait to Be Invited. Speak Up! Even though being authentic is important, there are some behaviors that we need to change. Women tend to want to be invited—invited to speak, participate, or join in. My invitation to you: cut it out. You have value to add and something to say, so speak up. I observed this phenomenon first hand at an event last year. Four people were participating in a presentation: two men and two women. The activities were pre-planned, yet when it was each of the women's turns, they had to be asked, "Do you have something to add?" As an observer, I felt this took something away from their content. Next, we tend to expect or assume people know what we want. I call this tendency "the osmosis effect." Somehow, by us thinking a thought and being in proximity to others, we think they'll just somehow know what we're thinking. Guess what? They don't unless we tell them specifically. If you want a raise, ask. If you want that promotion, don't think you'll be tapped on the shoulder and invited. Instead, apply. Don't assume your partner knows you want them to _______. Tell them. Lastly, at least for this article, take a seat at the table and don't sit on the sidelines—literally or figuratively. Next time you step into a meeting, take a look around and see who's sitting where. When you start to pay attention to who's around, you'll be surprised at how often women sit on the periphery or as far from the seat of power as possible. Instead, take a seat at the table and as close as you can to the meeting leader (better still, be the leader). Try some or all of this advice on for size; see if it fits, or if it doesn't fit, make the adjustments you need. When you can find your voice and use it, you can change the trajectory of your career and life; I invite you to give it a go. 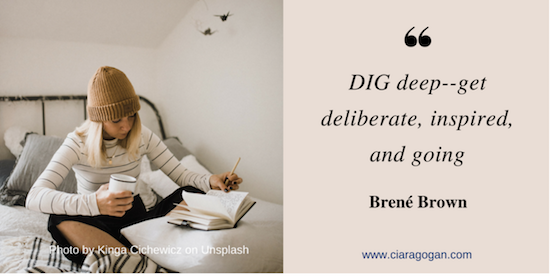 If I've piqued your interest and you could use some help making these or other changes in your life, head over to www.ciaragogan.com, and sign up for your complimentary session with me. Originally published on Ciara Gogan Life Coaching.